North West Company explorer Simon Fraser (1776–1862) opened the fur trade west of the Rocky Mountains, and was the first white man to descend the Fraser River to its mouth. Fraser was born in Bennington, Vermont, and came to Québec with his mother after his father, a Loyalist officer, died as a prisoner of war during the American revolution. Fraser joined the North West Company in 1792 and was sent to the Athabasca department. He became a partner in the company in 1801. 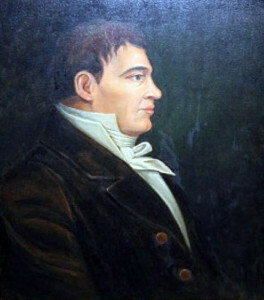 He founded the New Caledonia posts of McLeod Lake (1805), Stuart Lake (later Fort St. James, 1806), Fraser Lake (1806) and Fort George (1807). During May and June of 1808, with a party of nineteen French Canadian voyageurs, two clerks, and two Indians, Fraser made his great journey down the Fraser River from Fort George to present-day Vancouver. It was a bitter disappointment for him to discover that the river was not the Columbia, and that it was not a practical canoe route to the coast. In 1815, Fraser went to Montréal seeking to retire from the fur trade, but he was induced to return to Athabasca. On his return trip he was at Fort William when it was seized by Lord Selkirk in reprisal for the North West Company’s attacks on the Red River settlement. Fraser and other North West Company partners were sent to Montréal, charged with complicity n the attacks on Red River. When the trial took place at York in 1817, Selkirk was unable to prove his charges. Meanwhile, Fraser had retired and settled at St. Andrews, Upper Canada.